← Keeping motivated for Midterms! Dear internet, there are some things I need to tell you about jellyfish. Portuguese man o' war. Not a jellyfish. I. 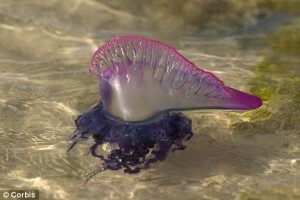 The Portuguese man o’ war is not a jellyfish. Just a colonial siphonophore out there giving ‘true jellyfish’ a bad name*. As opposed to being one nice little jellyfish friend floating through life just trying to get some noms and pass on some genes, the man o’ war is a well-staffed and highly efficient TOXIC BATTLESHIP OF FIERY FIERY DOOM –making its name quite appropriate. The man o’ war is made up of a regiment of specialized ‘individuals’, aka zooids. Each zooid has a distinct morphology that reflects its role. For example, the big, gas-filled sail that uses the tropical breeze to propel the animal toward your vulnerable flesh is one type of zooid. The others include the dactylozooid (defense), gonozooid (reproduction), and gastrozooid (feeding). The defense zooids pack the fire power, aka nematocysts. These cells are really more like grenades with the pins pulled just waiting for something to bump them and make them explode, and do this to you. The cells contain tiny, coiled harpoons with a venomous tip ready to be deployed on contact or chemical cue. This, it is important to note, means that the cells can still ‘sting’ you even after the animal is dead. What a jerk. II. This is not a thing: http://www.jellyfishart.com/ (also an unfortunate URL). YOU CANNOT KEEP JELLYFISH IN A TANK WITHOUT CIRCULATING WATER. Neither should they live on your desk. That would be 1. the wrong temperature, 2. unregulated salinity, 3. inhumane and they would be hungry because there are no plankton-y bits floating around for them to eat, 4. a violation of their privacy living in a glass jar where everyone can see their tentacles, 5. cruel and unusual punishment, as they should not have to suffer the torture of your cubicle confinement just because you got stuck with a crappy desk job. They may not have entirely sophisticated eyespots (or a centralized brain), but they can feel the despair. 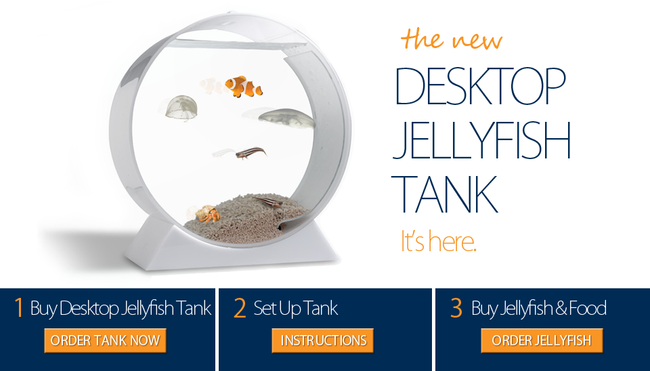 6. a rip off, because the starting price is $499 for the tank and the jellyfish ($40 for replacement jellyfish because they are certain to die–because that’s just what jellyfish do in captivity– and all they are giving you are moon jellies, which are the rats of the sea.) 7. this is not a thing. I would also like to note that Will Smith’s jellyfish in Seven Pounds was not a helpful or accurate portrayal of jellyfish pet-keeping. See I licked it. Moon jelly = no stinging. III. Not all jellyfish will sting you. For those of you in the Pacific Northwest, the three species you are most likely to encounter are the moon jellyfish, lion’s mane, and fried egg jelly. 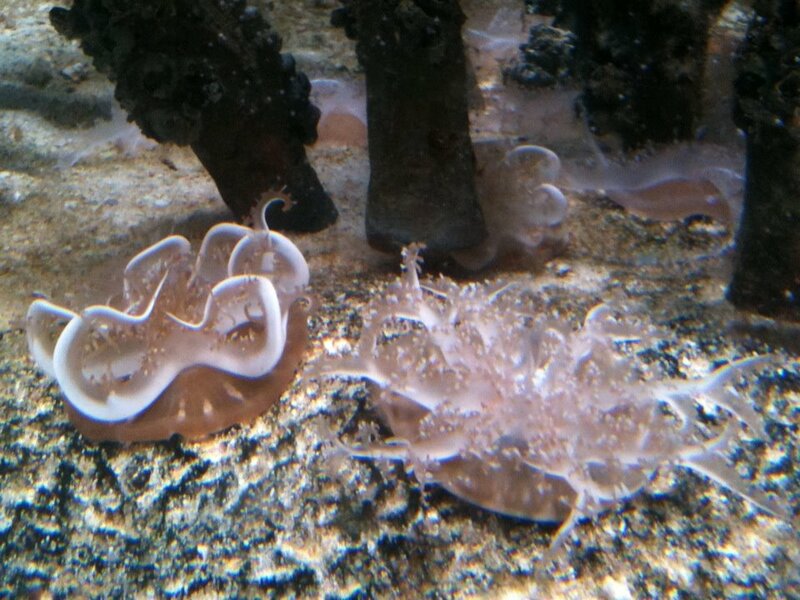 These are a great example of the spectrum of potency present in jellyfish species. Four-year-old Mary built towers out of cute little dead moon jellies after big storms on the beaches of Alaska, wheras the lion’s manes are the biggest jellyfish in the world and a single beached individual can sting a whole beach of people with its (up to) 120 feet of red, toxic tentacles. Fried eggs are somewhere in the middle. I’ve stuck my hands in them a few times to test it out and haven’t been stung. But I would still be careful with large individuals. Most jellyfish species have nematocysts, but these exploding cells carry species-specific toxins. That is why you can lick a moon jelly and be fine, but pretty much looking at a box jelly will kill you. A jellyfish’s toxicity is likely related to its prey type. While the moon jelly is just interested in little plankton-y bits, the box jelly is hoping for a full fish meal, and needs something stronger to knock its prey out with even the briefest contact. 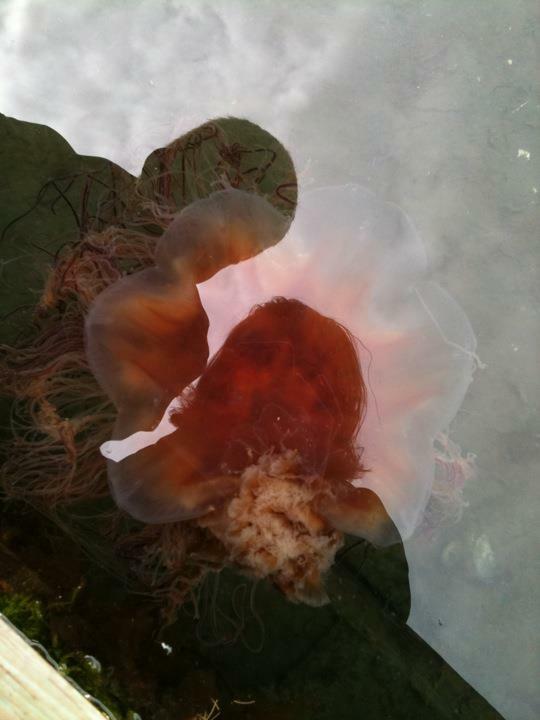 Stephen Reller and I found a pretty good size lion's mane stuck in the harbor at Point Defiance this summer. IV. You can eat jellyfish! I’ve been told they sell them in salads at the Met! Jellyfish is a popular snack in Japan, especially dried, but can also be served shredded and chilled. I’ve heard in this preparation it tastes like oysters but the texture isn’t so nice. In general raw jellies taste like saltwater and slide down quite smoothly. (One time I ate a live bioluminescent jelly just to annoy my mother, and I can only imagine that my internal organs proceeded to have a dance party). You can also find jellyfish icecream in some parts of the world, though I’m not sure why…Human consumption of jellyfish products was suggested as a solution to the recent invasion of giant jellies in the sea of Japan, but as a nutritional source there is really not much too them. For this reason, few species have bothered adapting to eat jellies (excuse this evolutionarily misleading phrasing) and they have relatively few predators. It should be noted that we humans are able to eat them because we can separate the tentacles from the fleshy bell and wash off residual nematocysts before consumption. It is not recommended that one consume raw jellyfish tentacles, to which most of my friends know I can personally attest. Some jellyfish are upside down. Don't try and turn them over. They were born that way. Kind of. V . Some jellyfish are upsidedown. That’s just how they are. 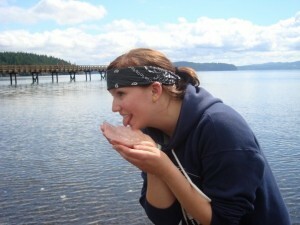 This entry was posted in Mary Krauszer '12, Uncategorized and tagged desktop jellyfish, jellyfish, lick a jellyfish. Bookmark the permalink.